Yep, I am a few months behind with updates, but I am finally starting to catch up! 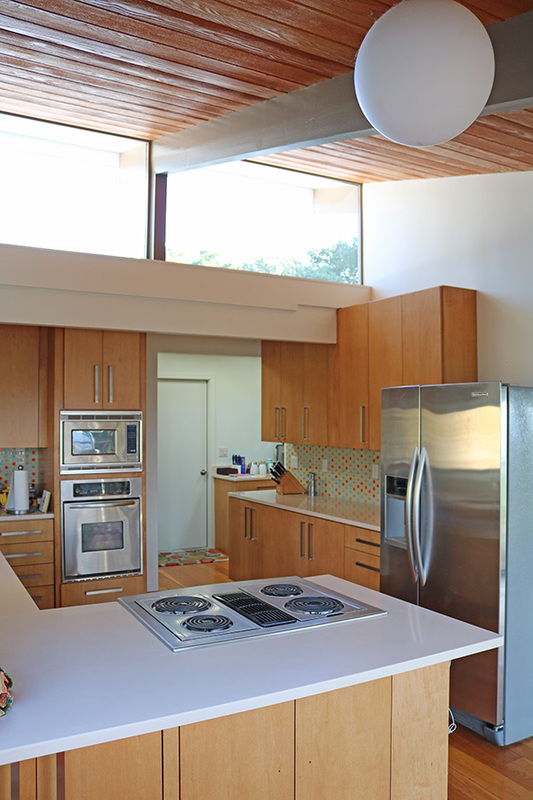 We were never fully in love with our kitchen and bathroom cabinets. I kicked myself for choosing such a dark stain. I was constantly getting clothing stuck on the handles as well. 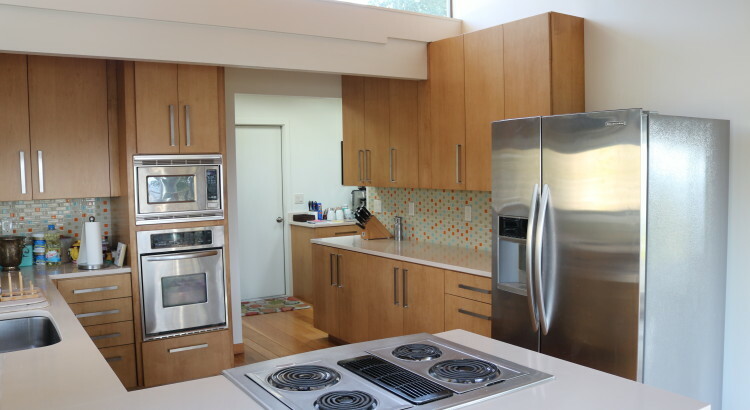 So rather than getting an entire new set of cabinets remade, we had them ‘refaced’ with a thin sheet of wood – that same birch as our new doors – glued onto the surface of the existing cabinets. It was a tedious process and there was a shitload of sawdust everywhere but cheaper than the alternative. 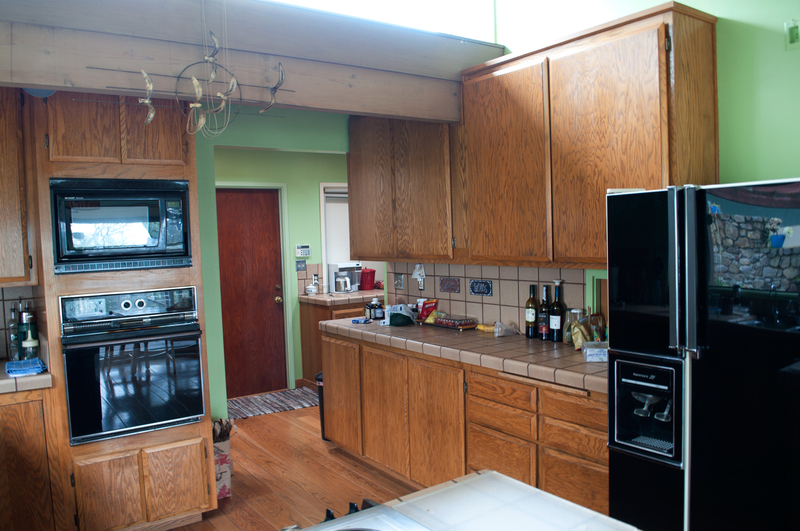 Before – Kitchen cabinets with dark wood stain. Sans cupboard doors – before Christmas. 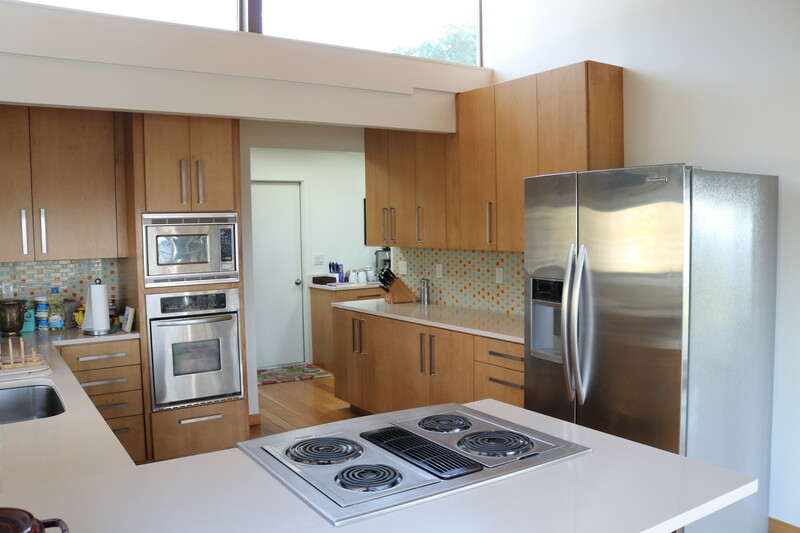 Unfortunately, coordinating with our painter and cabinetry people became a little tricky and we had to suffer with unstained cabinets over the entire holiday season. Our cabinet makers last words to us were ‘Don’t get anything on the wood, not even water’. Great. Clearly, our mischievous cat Benny did not get the memo. One evening while enjoying a glass of red, Benny – who was being chased by Sunshine at the time – leaped onto the kitchen counter and scored a direct hit on the just filled wine glass. Swoooooooosh! Crash! Red wine – all over a couple of the unstained cupboard doors. After much cursing and a few thoughts of becoming a cat free home , we managed to scrub out the worst of the stains. Luckily, our painters were able to get it out before they stained. Don’t get me started on how hard it was to keep water off of the cabinets in the bathrooms. 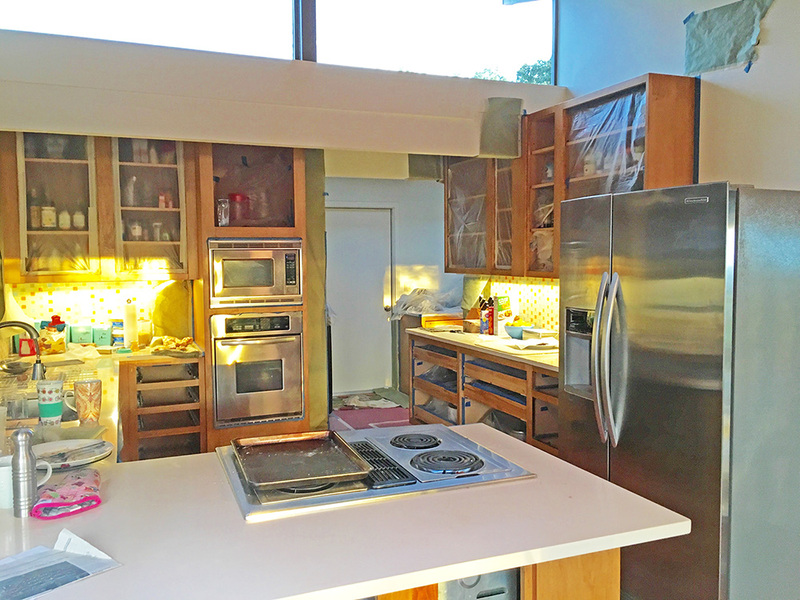 Flashback to what the kitchen looked like when we first toured the house and before we bought it. 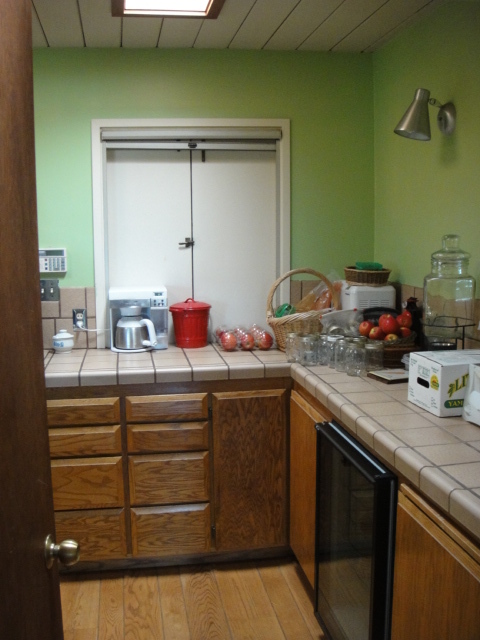 That green paint…..
And the butler pantry from a different angle. I will include some photos of the bathrooms in my next post. We are happy with how everything turned out. Xmas dinner turned out great DESPITE the mess in the kitchen. 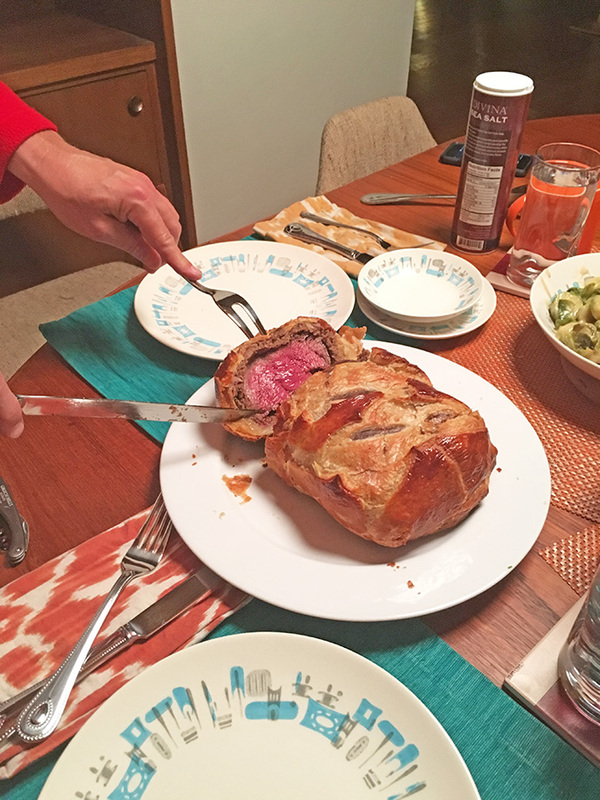 Check out that beef wellington, plus newly purchased vintage plate set off of Etsy. It’s called ‘Blue Heaven’ from Royal China. 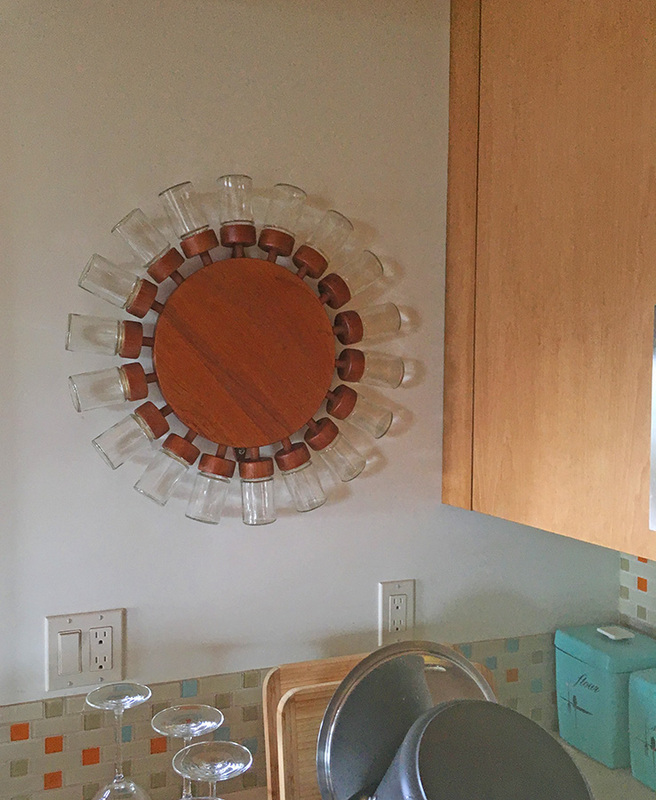 And check out my other Etsy purchase – a super duper danish modern spice rack made by Digsmed. I just have to get around to filling it! Your cabinets look almost EXACTLY like mine and I would love to do something like you do did with them. Am I correct in assuming that all that sawdust came from having to plane them straight before you attached the veneer? 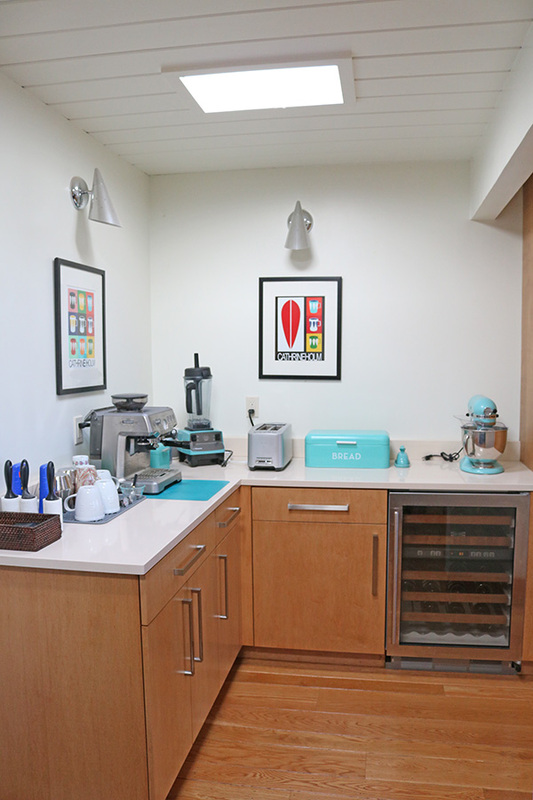 Your kitchen turned out FABULOUS! Love the back splash too! Hi Beth, Thanks. Actually the sawdust is from sanding the veneer before and after it is applied. They sand the surface in order to get a nice seal then lightly sand the veneer after before our painters stain it. It leaves a fine dust everywhere (ugh). Then our painters sand and stain 4 times. It’s a process but worth it. Hi Michelle, my husband and I live down on King Ave, and walk past your house on the loop often. We’ve been admiring what you’ve done with your house, and just met your husband last week. We are working on our house too, and really love the paint colors you’ve used for your house, eaves, and gutters. Would you be willing to share the colors? Everything looks so great! Thanks! Yes, my husband did mention you. Glad you like the house, isn’t the loop great? The base color for the house is Benjamin Moore ‘Cromwell Grey’ and the fascia is Kelly Moore ‘Oxford Brown’. The fascia reflects a blue hue in some sunlight. We like that. We used several whites around the house that are on the beams and under the eaves but I can’t remember what that is (it’s been awhile). Stop by when you are on the loop sometime, we’ll be happy to give you a tour! I just started following your Instagram feed, which led me to your blog. 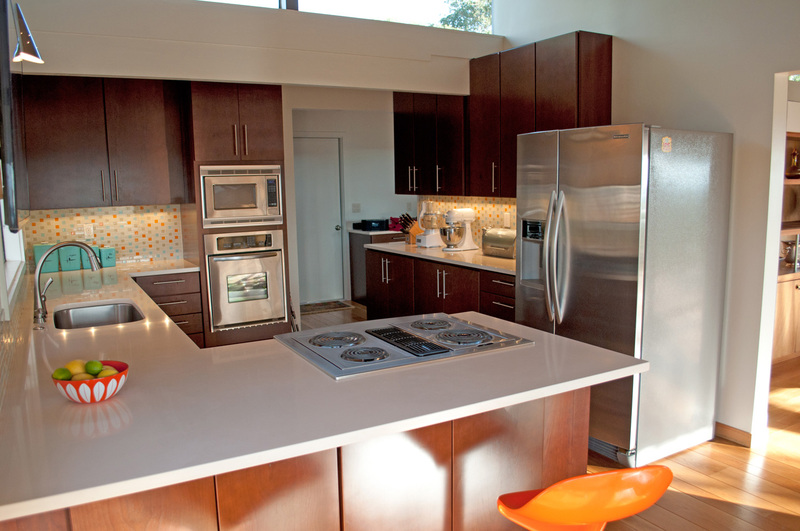 Your birch kitchen cabinets are beautiful, can you tell me what color they’re stained. And do you know what grade of birch they are??? I’m sorry, I don’t know this information off hand, but I will try and find out. Hi. I came across your blog via Pinterest. I’m wondering if you can tell me the source of your kitchen backsplash tiles? Thanks.